If you're unable to find one of our standard sizes to fit your project, we offer our Custom Cutting Service and Planing (P.A.R) Service for our Structural Green Oak Beams. Green Oak is a fresh cut (fresh sawn) oak that has been clear cut in the last 3-6 months, it is of high moisture content and is prone to shrinkage and movement during the drying process. Predominantly oak beams are used for decorative purposes, home structures as well as roof structures, the construction of oak framed buildings, bridges and marine structures - they can also be used for an array of external and landscaping purposes. Our ‘Customer Project Gallery’ will give you an insight into the projects where we have supplied our high quality Structural Green Oak Beams. PLEASE NOTE: When preparing our standard section size oak beams for delivery, we always try to include a little extra length to be assured that the beam will fit the customer's requirements. If you would like us to crosscut the ends, please let us know when you place your order. 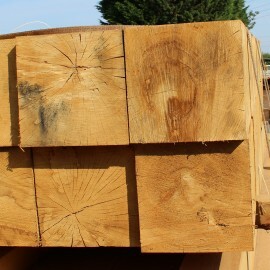 If you require a standard section size structural green oak beam to be planed, please contact our Sales Team on 01536 267107 who will be able to give you a price. 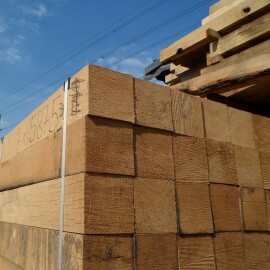 Our numerous sawmills cut to standard and custom sizes in Green English/European Oak (quercus robur). We can cut Structural Green Oak Beams to any size required and our on-site Graders will happily grade according to TRADA's THA (D40) or THB (D30) structural requirements amongst others for an additional charge. Our oak beams are cut according to the European QP1 standards and the THA or THB standards, as approved by TRADA. We aim to buy from FSC (Forest Stewardship Council) and PEFC (Programme for the Endorsement of Forest Certification) acclaimed sources only. Our oak beams have a minimum of 3 straight edges with a tolerance of a small amount of wane to one edge. They are better utilised in the construction industry and for property renovations. 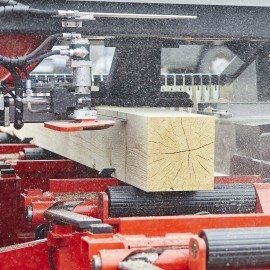 We always hold substantial amounts of trees to enable us to cut English/European Oak Beams to any size and any size order, from single beams to full truckloads. This item is cut to order, please allow several days for completion.